Lobster boats head out to sea off South Portland, July 25, 2018. At Maine’s annual Fishermen’s Forum in Rockport Friday, a historic $600 million harvest season coincided with a slight increase in lobster landings and lingering concerns over potential changes to gear rules around protecting endangered right whales. But looming over the forum are major cutbacks in the quota of crucial herring bait fish — which could ripple across the industry. Patrice McCarron, executive director of the Maine Lobstermen’s Association, is worried about the severity of herring restrictions imposed by the federal government after the species failed to reproduce in sustainable numbers last year. “It’s about as bad as we can imagine, but we don’t yet know what it’s going to translate to for the fishermen,” McCarron said. McCarron said that Maine fishermen face a shortage of some 50 million pounds of bait in the coming season. Fisherman are used to catching the traditional lobster baitfish in Maine’s coastal herring fishery all summer and into the fall, but McCarron said that will change under the new quotas. “We’re seeing an 84 percent reduction in that particular source of bait, so we’ll have less than 5,000 metric tons, which will probably be caught in a week, in one week,” she said. In a recent survey, 82 percent of the association’s members said the bait shortage could lead to an economic crisis in the industry. McCarron said that fishermen in remote locations may have the hardest time, because alternative bait sources are hard to get to. But she also said that she has faith in the creative solutions fishermen can cobble together. 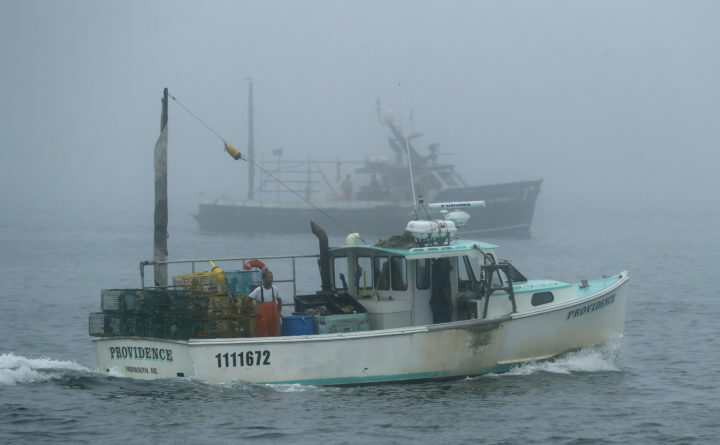 McCarron predicted bait prices will skyrocket when the lobster season really gets going in the spring, and that’s even if the menhaden, also known as pogies, return to local waters in force this summer, as they have the last three years. That has fishermen and state officials looking for new sources, such as frozen menhaden from the Gulf of Mexico, some types of carp, or even mink hides, as long as the fur is completely removed. Patrick Keliher, the commissioner of the State Department of Marine Resources, was peppered with questions about alternative bait. He said that to be certain an imported species does not pose a disease threat to native stock, state review processes can take time, sometimes months. Keliher said that while the bait crisis is an imminent peril, federal action to protect the endangered North Atlantic right whale could exacerbate hardship for the industry. He is working with regulators in other states and at the federal level to find solutions that will preserve the lobster industry’s viability. Those could include a requirement to reduce the number of rope endlines in the water by 40 percent, starting next year. He added that lawsuits that environmental groups have filed against the federal government to force new whale protections are an unpredictable factor. Lobsterman Addison Ames, who fishes 800 traps with his brother off Vinalhaven, said that between the bait crisis and potential new whale rules, he’s beginning to think about retirement. “Every notch they put in unfortunately, I’ll say, the going one way or another, it’s just another hard financial situation for us, and … it’s not going to work,” Ames said. Both state and federal level regulators are expected to propose new gear rules by spring or early summer. In the meantime, the great bait hunt is on.